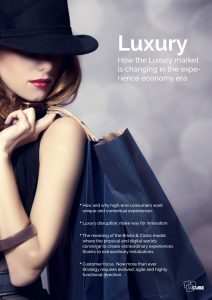 The luxury market is evolving and seeing changes in its consumers and their needs: consumers are increasingly international, globetrotting and millennial, they are connected to their smartphones, committed to omni-channel experiences and they seek originality and fun from the exclusive luxury experience. Increase in luxury consumers from emerging countries such as Russia, Asia, South Korea and especially China (2017 data: 1 in 6 customers in Italy is Chinese). The luxury customer is a globetrotter. They travel a lot and tend to buy abroad (45% of Chinese consumers purchase abroad). 30% of luxury buyers are millennials, with an average spend of $1,400. Millennials will represent 50% of buyers by 2024. Luxury clients are increasingly smart. They use their smartphones to make purchases, communicate and get information. The use of social media as a source of information and word of mouth is increasing (social media is the primary source of information in China). “Made in” is a fundamental requisite for luxury consumers, but millennials also place originality and fun among the important values that make a brand attractive. Even the luxury market is seeing a shift of the value chain towards the client, embracing an omnichannel approach to promote new methods to attract, engage, communicate and develop customer loyalty both online and in-store. The store physically represents the brand and immerses the client in a memorable and multisensory experience.